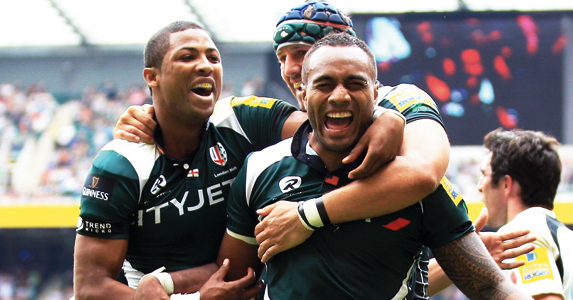 ‘The Samoan Superman’ and London Irish wing took some time out before the 2010 Autumn Internationals had kicked off to chat about banter, church services, and being wary of Seilala Mapusua. Also loving sunday roasts. RUGBY WORLD: Are you looking forward to Samoa’s Tests against Ireland, England and Scotland this month? SAILOSI TAGICAKIBAU: It’ll be good to be playing against guys I usually play in the Heineken Cup, and hopefully some of my London Irish team-mates too! RW: Do you have a lot of banter with the England guys at Irish? ST: There’s never a moment when there’s not banter between me and Delon (Armitage). He won the last match I played against him, when I played for the Pacific Islanders. But I ran round him once during that game so I’ve still got my pride! RW: Who are Samoa’s jokers? ST: Seilala Mapusua is never too shy to speak up when he’s not meant to be speaking and always has a few things up his sleeve, like pulling someone’s pants down at the airport! RW: Are any of the Samoans superstitious? ST: Census Johnston wears the same striped underwear for every game. In video clips of him playing, if his jersey rides up you can see he’s wearing them! RW: What do you guys do to wind down? ST: We have little church services as a team because we’re all quite religious and it brings us together. We have them the night before the game and now and then during the week. It gets everyone calm and chilled out, and we sing a few songs too. ST: Someone farting during a tackle! RW: If your house was on fire what three things would you save? ST: My phone and my PlayStation, and a photo of my family. ST: Topsy (Ojo) is the worst. He itches his throat when he sleeps and it makes a noise. My best is Seilala. He’s got loads of up-to-date music and movies. ST: MacGyver, because he could get me out! ST: Against England in the 2003 World Cup. We lost but were leading ‘til the 65th minute. And Jonny Wilkinson missed his first kick at goal! RW: If you weren’t a rugby player what would you do? ST: I’d like to play basketball in the NBA. ST: Losi or Los. My favourite, which I saw in the paper, is ‘The Samoan Superman’. I’m trying to make that one stick but no one wants to call me that because it’s such a high name to live up to! RW: What are the best and worst things about living in the UK? ST: The winter here is too cold, and there are no nice beaches I can easily drive to! But I have big expectations coming from a tropical island. And the best – Sunday roasts with all the trimmings. And I love rice pudding. ST: Any creepy crawlies and I don’t like snakes or lizards. ST: A hot country on a sandy beach with my family all together. RW: What are your happiest and saddest memories? ST: My happiest is the birth of my son, Zachary. I was there for the whole shebang. And the saddest is when my granddad passed away and I couldn’t get to Fiji for the funeral. ST: My cellphone. Elvis (Seveali’i) doesn’t have one and it’s so hard to get hold of him. RW: What last made you angry? ST: My brother, Michael (a Saracens wing), didn’t get me tickets to his game at the weekend. He gave them away but you’d think he’d put his family first! RW: When was the last time you laughed?